I am all excited and geared up to see the new India under the new authority. 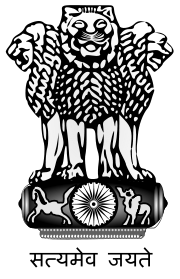 On the same day of my blog’s anniversary the new Indian government sworn in. 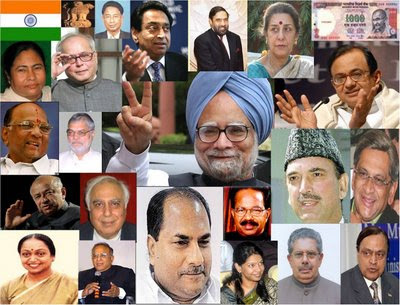 The United Progressive Alliance (UPA) is all set to setup the second consecutive government. The elections are over. The exit polls are gone and the counting has ended. We have the results out. The UPA has won beating the other parties and Dr. Manmohan Singh is the new King of Indian politics. He is going to take charge for the second consecutive term and I am sure he will do best this time – well, alike billions of Indians, I have the same hope and dream. I wish him all the very best from one and all. May God bless him and may he succeed in whatever he does in the coming 5 years. Incidentally, he swore in on the same day 5 years ago! Along with the Prime Minister, a bunch of old and new faces entered the cabinet. Each one will have their own ministry and responsibilities. I hope we have chosen the right people and they will do only good to the country and its countrymen. Here is a collage of the ministers – for all of you to know. I have a lot of hopes, as all you have. I hope the recession passes away and we see new avenues of employment and opportunities. I hope there is more tax collected from places where it was never done before. I hope our defense get good support from the DRDO and it gets good support from the new government. I hope we filter our opportunities and realize them successfully. I wish to see more medals in the Olympics and a better National Football team. I hope to get the zealous Hockey team back. I wish to have a better future for us – for me, for you and for all those who breathes in India. I wish to wake up in a better tomorrow. I hope to see the rainbow next time it rains! There is no end of my wishes – hope I see an end in terrorism. Let us all wake up in a better tomorrow and let the people of Indian socialist sovereign republic get all that they deserve and have longed for. They have been chosen by the people and have been filtered out of the people – now, let them work for the people too. In this occasion let me remember the Golden Words of Abraham Lincoln (during The Gettysburg Address): Government of the people, by the people, for the people, shall not perish from the earth. Cross posted at: Thus Spake Tan!